Established in 2004, Hi Amp Electric , a family owned business and a full-service electrical contractor, provides electrical wiring for both new and remodel commercial, residential,industrial and institutional facilities in Puget Sound Washington. 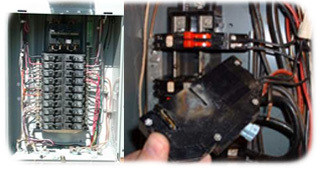 It is the purpose of the company to provide timely electrical service at a competitive price. Time after time, you can rely on quality craftsmanship from Hi Amp Electric employees,who are committed to serving the client's best interest. Call Mike @ 888-278-3616 for a firm, competitive quote for your electrical project. Electrical problems fixed too. Check for outlets that have loose-fitting plugs, which can overheat and lead to fire. that are accessible to children. Make sure cords are in good condition—not frayed or cracked. Make sure they are placed out of traffic areas. carpets or rugs or rest any furniture on them. prevent young children from shock hazards and mouth burn injuries. fit a two-conductor outlet; this could lead to an electrical shock. NEVER FORCE A PLUG INTO AN OUTLET IF IT DOESN'T FIT. Plugs should fit securely into outlets. Avoid overloading outlets with too many appliances. GFCIs can help prevent electrocution. They should be used in any area where water and electricity may come into contact. When a GFCI senses current leakage in an electrical circuit, it assumes a ground fault has occurred. manufacturer's instructions monthly and after major electrical storms to make sure they are working properly. Replace all GFCIs that are not working properly, but never replace a GFCI with a standard non-GFCI outlet or circuit breaker. take the appliance to authorized repair center to be checked for faulty wiring or replace it. Check the wattage of all bulbs in light fixtures to make sure they are the correct wattage for the size of the fixture. check with the manufacturer of the fixture. Make sure bulbs are screwed in securely; loose bulbs may overheat. Circuit breakers and fuses should be the correct size current rating for their circuit. If you do not know the correct size, have an electrician identify and label the size to be used. Always replace a fuse with the correctly specified size fuse. unplug it and have it repaired or replaced. plugs and connectors. Use a surge protector bearing the seal of a nationally recognized certification agency. Electric-powered mowers and other electric tools should not be used in the rain, on wet grass or in wet conditions. power tools when not in use. When using ladders, watch out for overhead wires and power lines. appliances, phones, fax machines and modems. plug directly into an outlet on a relatively unburdened circuit. Halogen floor lamps operate at much higher temperatures than a standard incandescent light bulb. Never place a halogen floor lamp where it could come in contact with draperies, clothing or other combustible materials. lamps in children's bedrooms or playrooms. Consider using cooler fluorescent floor lamps. at the circuit breakers or fuses. Don't forget to test every conductor before you make contact with it. Never use the ground wire as the neutral or circuit-carrying conductor. be sure the insulation on the wires is completely covered by the wire connector. 6 Easy and Inexpensive ways to cut your electric bill! Save as much as 20%-30% on your heating or cooling costs by allowing for multiple daily settings and automatically adjusting when the outside temperature changes. Moving air tends to feel cooler, allowing for higher summertime thermostat settings. According to EREN, the effect is equivalent to lowering the air temperature by about 4 F (2 C), and using less energy than air conditioners in doing so. Set the unit on reverse and it will bring the warm air down. CFL's use up to 75% less energy than standard incandescent bulbs and last up to 10 times longer, according to Home Energy Saver. Among household appliances, the refrigerator is likely your biggest energy consumer, especially if it's more than 15 years old. It can account for up to 9% of your energy costs alone. Again, use the Energy Star site for a list of energy-efficient models if you're looking to replace yours. Heating water is the third-biggest home-energy cost and typically accounts for 14%-20% of your energy bill. Because hot water jackets usually sell for $10 to $20, shipping charges for buying them online can easily increase their cost by 50% or more. It's best to use the Web to find offline deals in this case. At the Home Depot site, I found a $10 Frost King vinyl-cased fiberglass jacket for water heaters up to 60 gallons and used the online site to find the closest store. If you use space heaters instead of central heating, you can save nearly $1200/year! If you use fans instead of air conditioning, you can save about $600/year. If you dry your clothes on a line instead of in a dryer, you can save $150/year. If you wash your laundry in cold water instead of hot, you can save $150/year. If you replace regular light bulbs with compact fluorescents, you can save nearly $100/year. If you get rid of your television, you can save $75/year. If you put your computer in sleep mode when you’re not using it, you can save $60/year. Hi Amp Electric is a Full Service company. This means we are able to provide our customers with a full range of electrical services, from Service Calls to Custom Residential Construction to Multi-Story Building Renovation. Here is a list of some of our most frequently requested work. We install all kinds of dedicated circuits 110v to 220v to 480v. When you install a major appliance in your house you may need a Dedicated Circuit. Also today's codes require some circuits in kitchens and bathrooms to be dedicated as well as being protected by GFCI outlet. Weather you build a new house or adding a room, we do all new construction installation from A to Z. All Electrical wiring as well as low voltage, including, Phone, TV and Data. It is important to be aware of all the different lighting options, and which kind of lighting will work best for each customer. At Hi Amp Electric. we specialize in Light Design and helping each customer select the best lighting available to fit their special needs. No need to hire another company for low voltage wiring. We do it All! - New phone jacks, TV outlets, and Ethernet Cat5 wiring for Data. Dedicated Lines, 220v supply for all types of A/C units. All types of Bathroom Exhaust Fans and Heaters. We do replacements and new installations as well as roof ducting. Let the professionals do it. When you need to mount your flat panel TV, we do it all. New outlet hidden behind the TV, Professional TV Mount and all wires concealed in walls. Let a professional contractor do it for you! Today's code require all smoke detectors in the house to be hard wired together, with battery for back-up only. Puget Sound Washington Electrical Contractor and Electricians - If you’re in need of some serious re-wiring, Hi Amp Electric's electricians will shock you back to normal. Puget Sound home and building. At the most basic level, we install wires, which carry electricity throughout the home or businesses. Our experts also repair electric machinery, fix or replace bad wiring, or install surveillance wiring. Puget Sound electrical contractors are always employed as part of a new home or building. They are vital when preparing and implementing electrical blueprints. These blueprints typically include information on where wires will be routed, identify potential wiring problems or hazards, and highlight the location of electrical equipment and outlets. Hi Amp Electric can run conduit inside walls for wiring, install junction boxes on the walls to hold switches and outlets, and pull wires through the conduits to connect the boxes and create a circuit so the electricity can flow. Puget Sound electrical companies, services, review, businesses, reviewed, find, recommended, around,in,near, best, cheapest, least expensive, inexpensive, affordable, same day, 24 hour, report, cheap, price, prices, cost and free.